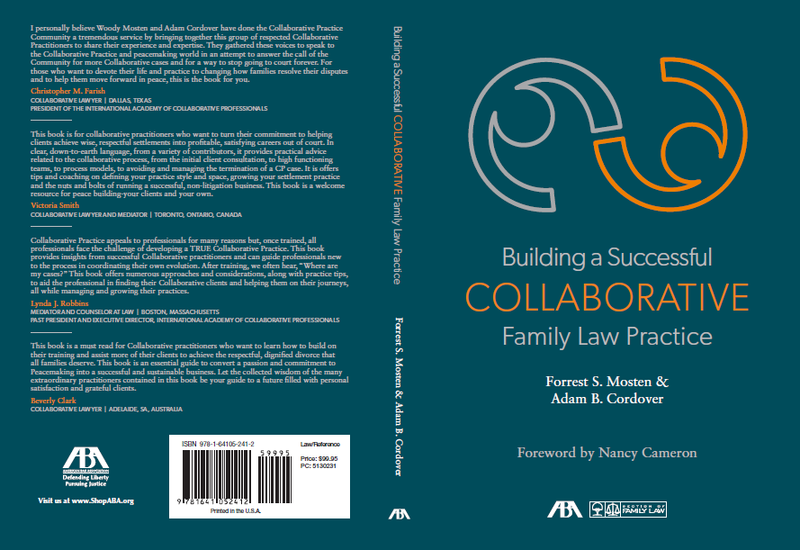 Today, the American Bar Association releases “Building A Successful Collaborative Family Law Practice,” edited by Forrest (Woody) Mosten and Adam B. Cordover. The book includes experts from around the field in collaborative practice and out-of-court dispute resolution. I personally believe Woody Mosten and Adam Cordover have done the Collaborative Practice Community a tremendous service by bringing together this group of respected Collaborative Practitioners to share their experience and expertise. They gathered these voices to speak to the Collaborative Practice and peacemaking world, in an attempt to answer the call of the Community for more Collaborative cases and for a way to stop going to court forever. For those who want to devote their life and practice to changing how families resolve their disputes and to help them move forward in peace, this is the book for you. This book is for collaborative practitioners who want to turn their commitment to helping clients achieve wise, respectful, settlements into profitable, satisfying careers out of court. In clear, down-to-earth language, from a variety of contributors, it provides practical advice related to the collaborative process, from the initial client consultation, to high functioning teams, to process models, to avoiding and managing the termination of a CP case. It is offers tips and coaching on defining your practice style and space, growing your settlement practice and the nuts and bolts of running a successful, non-litigation business. This book is a welcome resource for peace building-your clients and your own. Collaborative Practice appeals to professionals for many reasons but, once trained, all professionals face the challenge of developing a TRUE Collaborative Practice. This book provides insights from successful Collaborative practitioners and can guide professionals new to the process in coordinating their own evolution. After training, we often hear, “Where are my cases?” This book offers numerous approaches and considerations, along with practice tips, to aid the professional in finding their Collaborative clients and helping them on their journeys, all while managing and growing their practices. This book is a must read for Collaborative practitioners who want to learn how to build on their training and assist more of their clients to achieve the respectful, dignified divorce that all families deserve. This book is an essential guide to convert a passion and commitment to Peacemaking into a successful and sustainable business. Let the collected wisdom of the many extraordinary practitioners contained in this book be your guide to a future filled with personal satisfaction and grateful clients. A quiet revolution is reshaping modern family law practice, moving it from the courtroom to the conference room. Woody Mosten and Adam Cordover, two of its leaders. have assembled the best practitioners in the field to create a practical guide that helps family lawyers understand and join the collaborative revolution. Their book shows that it is possible to develop and maintain a profitable practice and provide the kind of representation that we went to law school for. It is a gift to the profession and the families and children we serve. Insightful. Practical. Inspiring. Building a Successful Collaborative Family Law Practice offers essential tips from experienced professionals committed to the peaceful resolution of family disputes. What is striking about this collection is the generosity of the contributors, who offer their experience and wisdom – gained from “lessons learned” – to help others create professionally and financially rewarding careers outside of court. As a family lawyer who no longer goes to court, I am acutely aware of the pressures our profession faces when we seek more integration between our personal values and our professional lives. We all thank Adam and Woody for pulling together this collection to teach others that it is possible to have an authentic and productive law practice focused on peace. Adam Cordover and Woody Mosten are leaders in finding new ways to serve clients in divorce proceedings. This book highlights collaborative law and provides a how-to (and how not-to) guide for practitioners: from the perspective of over 20 experts. It is engaging, highly informative and inspiring. Among other things, the authors recommend that lawyers undertake multi-disciplinary training, hone management expertise and ramp up marketing efforts – all in service of allowing families to ‘make and keep peace’ through the divorce process. Tired of angry clients, demanding judges and divisive processes? Dip into collaborative law, under the tutelage of Cordover and Mosten – win/win for clients and for their lawyers. This compilation captures the essence of collaborative practice and its value for families and practitioners. The practical input in each chapter provides both a foundation for new practitioners to learn from an amazing array of experts and a reflective resource for those with experience to hone their skills. It is essential reading for anyone looking to establish a high-quality practice focused on helping families find peace and resolution. The diversity of practice approaches, professional disciplines, and personal insights makes this book an invaluable resource for all professionals who want to join the growing numbers of us committed to changing the culture of family law in a positive way for families. Woody has done it again! This time, he had help from Adam Cordover whose additions proved to be everything you would want from a co-editor. The chapter contributions were from the most stellar leaders in the field, the organization of the book truly lends itself to being the premier guide for building a practice that is client-centered, client-focused, and client-driven. For too long, family law practitioners have utilized a slash and burn approach to reshaping families when spouses decide to part ways. I sincerely hope this book has a prominent place on the shelves of all family law practitioners and becomes a prominent tool in the family lawyer toolbox. Mosten and Cordover’s anthology offers fresh and useful dispute resolution strategies that can be adapted by lawyers and others who would prefer to help resolve family conflict by mutual agreement, rather than in search of a “victory” that too often turns out to be hollow. Woody Mosten has translated his career passion for peacemaking into a far reaching book that will help individuals and organizations better resolve disputes and prevent future conflict. Author: How Mediation Works: Theory, Research, and Practice (2017) (Co-authored by Jeanne M. Brett and Beatrice Blohorn-Brenneur), and Dispute Resolution: Negotiation, Mediation, Arbitration, and Other Processes, 6th edition (2012) (Co-authored by Frank E. A. Sander, Nancy H. Rogers, and Sarah R. Cole). Feeling a bit estranged from litigation in your Family Law practice? Thinking about a dissolution of those ties, but concerned about personal finances, professional identity, and skills development you were to develop a new relationship with Collaborative Practice? For advice about the decision and a survival manual once you have made the commitment, look no further than Building a Successful Collaborative Family Law Practice, by Forrest S. Mosten and Adam B. Cordover (2018). In its themes and organization, this brilliant compendium mimics the very qualities it describes and inspires among collaborative professionals. It reflects upon, and commits to, a strong set of values and principles; empathizes with the needs of its audience; engages the reader as a partner in a flexible journey, within an interdisciplinary team; and offers clear summaries and concrete tips. This book opens hearts, minds, meaning, and opportunities even as it navigates realistically what for many will be new and challenging professional terrain. This comprehensive set of essays about building a collaborative law practice is full of gems. Always keeping a commitment to peace-making and care for long-term health of family members at the forefront, it describes a variety of models of collaborative law and discusses when to use a hybrid approach with elements of mediation and of collaborative law. Chapters such as the one about collaborative marriage planning introduce new ways collaborative law practitioners can assist families. Woody Mosten, Adam Cordover, and the contributing authors of the book have assembled a complete manual about how to serve your clients well and how to build your collaborative law practice. When I began reading this book one afternoon, I could not put it down until I had read every page. This is THE book for building a collaborative family law practice. Forrest Mosten and Adam Cordover have assembled an amazing collection of collaborative professionals to explain in detail the essential keys to successfully establishing a collaborative practice. In step by step explanation, the book details the process necessary to implement a practice. Training, networking, office setting, working in the inter-professional environment, the importance of the first meeting, and steps to avoid impasse are all explained in a most useful manner. Every collaborative professional should have this book. Thank you to Woody and Adam for your insight, time and efforts in creating a book for new and experienced collaborative professionals. I found this book to answer the most frequently asked questions by those new to this specialized field and address them in a practical and usable manner. Having input from so many respected professionals in our field only heightens the value of this book. It is a must-read for those who are new to collaborative practice and will serve as a good refresher for those of us who have been practicing for years. The growth of collaborative practice is enhanced by a new anthology from the ABA. Forrest “Woody” Mosten and Adam Cordover have assembled 22 creative and well-researched articles they accurately call a “tool kit” for collaborative professionals. With their own introductions, prologue and conclusions, and many resources along the way, they make the case for collaborative law as not only a viable process, but often a better path. They address how to set up a collaborative practice, grow it, make it profitable, and carry it out effectively. Collaborative attorneys may consider this book as an investment in a satisfying professional future. This book delivers more than what its title suggests. Collaborative financial professionals will find both inspiration and practical tips in the chapters of this book. I can see that this book will become a well-worn reference on my shelf that I will return to often for guidance and useful ideas I can implement in my practice as a professional Peacemaker. David Harper’s chapter on “Traits and Skills of a Highly Effective Financial Neutral” is a must-read for both more and less experienced financial neutrals. Thanks to all the amazing collaborative professionals that contributed their valuable insights to this book! Many of us who became family law attorneys aspired to assist individuals through family transitions offering hope for a better future. Too often, however, we lost sight of our compass as the realities of the legal system and our professional and personal lives set in – the need to work within the confines of court procedure, immutable statutes and a sea of case law, set against the desire to build a strong reputation and the need to support our families. Woody and Adam brought together the best Collaborative professionals who faced this reality and successfully paved an alternative path forward, using Collaborative lawyering. Building a Successful Collaborative Family Law Practice is a compilation of their ideas and concrete steps for establishing an economically sound peacemaking law practice, congruent with aspirations to best assist clients through family change. This book is a must read for any family law attorney who has secretly or not so secretly desired to build such a practice but questioned the viability of doing so. Woody and Adam have put together the ultimate guide to developing a Collaborative practice. Whether you are just starting out or have been working at building your own Collaborative practice, this book is must reading. This is the most comprehensive “how-to” on developing a successful practice. For me, it reinforced much of what I am currently doing and gave me so much more to think about and so much more to implement. If every Collaborative professional read this book I believe the failure rate of 11% would be even lower. Over the years of working with hundreds of Collaborative Practitioners all over the State of California as a former President and board member of Collaborative Practice California (CP Cal), I have found a common theme. Many folks want to be peacemakers in their practices. They just don’t know how to do it as a successful business. All too often, they give up. Adam and Woody have masterfully assembled an amazing collection of real-world advice from some of the most successful peacemakers in the world to give even the most apprehensive practitioners tools to build a successful and fulfilling Collaborative Practice. I heartily endorse this great work. 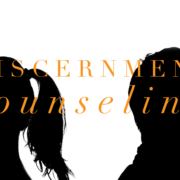 Discernment Counseling: What If Only One Spouse Wants to Divorce? What Can I Do To Reduce The Costs Of My Florida Divorce? Pre-Order Cordover Mosten ABA Book Now! Alimony Tax Deduction: Is It Too Late To Divorce in 2018?